marriage of medicine and industry creating what is known as the medical-industrial complex. The medical-industrial complex is manifest in many ways including the extinction of the private, solo medical practitioner and the rise of things like copyrighted medical procedures. In the not too distant past, most doctors were solo practitioners and thus provided the kind of medical care that made physicians respected and pillars of the community. Among surgeons the attempt to copyright a surgical procedure is distasteful as the important surgeons we have known in our training taught surgery without taking credit or financially benefiting from their ideas and procedures, even if revolutionary in nature. If an operation shows particular promise and represents a true advancement in medical care, it is usually submitted to a peer reviewed journal where its merits are debated among professionals in the field and either accepted for publication or not, depending on the originality of the idea and its ability to advance medical knowledge, but never for financial gain. The recent introduction of the copyrighted named surgical procedure uncovers one of the weaknesses in trademark and copyright law as the procedure on which the trademark is licensed does not have to be in any way original except the name itself has to be unique. The only reason to give an operation that is not original a trademarked name is for the purpose of marketing for financial gain. Many less informed patients may believe that a trademarked name for a surgical procedure implies that the procedure, whether unique or not, is the most important aspect of patient care usually proven with a slick marketing plan. It is clear that the “named” procedure is of minuscule importance when compared to the ability of the surgeon and whether the procedure is the correct one to treat the problem addressed. The “Lifestyle Lift” is the latest marketing madness purposing a questionable procedure by marketing the name rather than the credentials of the physicians who perform the trademarked “Lifestyle Lift.” I suspect that on occasion the “Lifestyle Lift” may actually provide a satisfactory result, if by luck the right patient sees the advertisement and gets a surgeon provided by the company, who performs the procedure resulting in a happy patient. I get to see the results of the “Lifestyle Lift” and are asked to explain why such a well marketed operation did not accomplish the facial rejuvenation promised. Many times, the patient dissatisfaction results from the limited improvement on the cheeks only while the neck, eyes and mouth, of equal importance, are not addressed with the “Lifestyle Lift.” Most plastic surgeons find that addressing all of the aging issues usually allows the procedures to be “blended” together for optimal results. 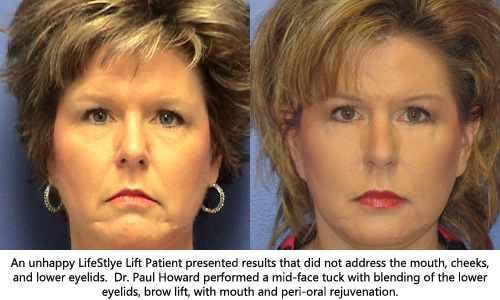 Alabama facelift specialist Dr. Paul Howard is a Board Certified Plastic Surgeon in Birmingham, Alabama. To schedule a consultation with Dr. Howard, call 205-871-3361. *The LifeStyle Lift is a registered trademark, registered by Lifestyle Lift Holding, Inc. Michigan.